With changing seasons come changing personalities. While the winter months often cause us to migrate indoors, hibernating in the warmth of our own homes, summer tends to do the opposite. And the changes in our own seasonal behaviours can also be strongly reflected in our moods, too. Some of us get sad (or SAD) in the winter, which only further enhances the outwardly expressed happiness that summer brings with it. There are the outwardly details which are immediately recognized, the architecture, the streets, the landscape. But then there are the inward personality traits which only become apparent with time, and truly come to represent the city: it's people, their way of life, the food, the cultural differences, the collective beliefs. And on my second return to Zurich, Switzerland - now in the warmer season - which was directly related to my first visit in the still very chilly month of February, I realize that cities - just like people - can suffer from seasonal affective disorder, too. As it turns out, cities get SAD in the winter - just like you and I. It's not as though Zurich is a terrible place in the winter, either, and surely anyone who loves to ski would be enamoured by it during the colder season. My first trip to the small city which houses the majority of one half of my family brought with it many insightful and gratifying discoveries, indeed. But. yet again - with a general shortcoming of adjectives which can appropriately describe the process of traveling and learning to understand a new place - I found myself with one (perhaps unintelligible, but true) statement for describing Zurich in the winter: "It's just so cute!" Zurich, like a rose, blooms during the warmer months. 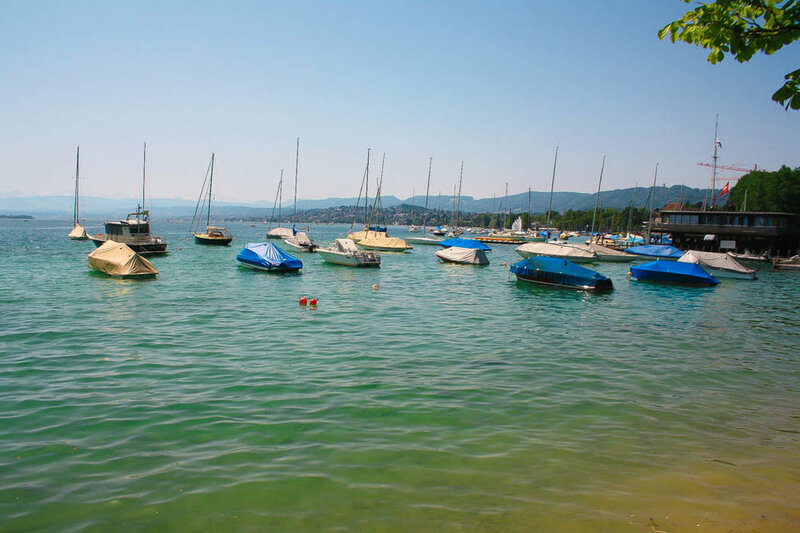 It was hard for me to imagine the kind of lakeside paradise I'd find in Zurich, which was fully accompanied by the summer-happy attitudes of the swiss locals. We quickly found ourselves strolling along Lake Zurich, enjoying the musical entertainment of the street performers (one of my favourite things about Europe, to date). People sunbathed on the rocks near the lake, and around the grass near the Chinese Garden. People congregated in groups to enjoy a bottle of wine or beer, chatting and laughing heartily. Food stands added to the heat of the day, putting a plethora of bratwurst and the like on display. People even swam around the docked boats in the Limmat River, which - to our surprise - is a perfectly hygienic way to cool down. Clean water in Switzerland, who knew! It wasn't long before we found ourselves at Bad Utoquai, which is a bathhouse on Lake Zurich and the opposite of bad in english. This 'seebad' or Lake Bath is incredibly amazing. It's not really a bathhouse, as experienced in Budapest, but more like a house-sized dock on the Lake, offering a multi-level comfortable and dry place to sunbathe after jumping in the chilly waters of Lake Zurich. With the comfort of enjoying the night scene without the fog of my breath blocking my view, Zurich became a much more intriguing place, whereby "cute" simply didn't cut it.